Stopped in for a beer sampler and enjoyed it. They had an excellent selection of thief beers on tap both standard menu items and additional seasonal beers. I had the four beer sampler ( I think beer sampler's should have at least 6 to 8 beers-- especially when you have 15 or more on tap at one time). Of the four beers I had, I thoroughly enjoyed two of them, an IPA and a stout, one, an IPA seasonal, was OK and the last one, a larger, I did not care for. The place is hidden away in the back of the shopping center, however, it's right on the marina and we sat outside and enjoyed a nice atmosphere. Overall, definitely worth the stop. Next time I'm back, I'll make sure I have more time and have at least two samplers, maybe three. 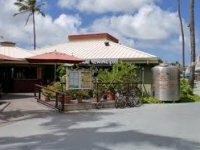 Fairly typical brewpub from Kona with open air seating about 10 minutes from Waikiki. Selection is little more than the typical list that you can get on the shelf in Central Illinois. But, Happy Hour goes from 3-6 with $4 pints and $4 appetizers. In Honolulu, that is pretty much free. This place is located in a nice, uncrowded marina about 6 miles away from Waikiki beach. It is not overly crowded by tourists, which is plesent for a tourist that dosent like crowds. It is located less than a mile away from Hanauma Bay, which is an amazing park for snorkeling. It has a nice view of the marina. A bar is located in the middle, with tables on all sides. The kitchen is visible near the entrance. One of the menus we recieved has a bunch of dirty food inside that never got cleaned off. The waiter was friendly, and knowledgable. the beers came out fast, and he made sure that we always had a glass. The food, on the other hand, took a really long time to arive. There were not too many people in the place during lunch time when we went, but it took almost 45 minutes to recieve our food. It wasnt to bud, but slightly annoying. The beer selection was good. They had about 10 Kona beers on tap. Unfortunately, they didnt have the IPA, but the had the Koko Brown with coconut, and that was nice. The food was good. Pizza, some sandwiches, and a few pasta dishes mostly. They could have had more fish, since it was located in a marina in Hawaii. The price was just a little steep, but for hawaii, it was probably ok. $5.25 a pint. Overall: This might be the best beer bar I have been to in Hawaii. I have not been to any other island other than Oahu, but this place is pretty good. I was worried at first since it was Kona, but I learned my lesson. If you are near here, stop by. Hawaii can be a tough place to be a beer fan. If you put this pub in certain areas on the mainland it might rate average, but in Hawaii it's a welcome addition. I like many KBC styles and they have many that are difficult to find or unavailable elsewhere. I like Pipeline Porter, Black Sand Porter and Castaway IPA. They also have rotating specials that a frequently quite good. The food is okay. The pizzas are tasty and I enjoy the mac nut cheese bread, hummus and roasted garlic pupus. I find all their salad dressings too garlicky and the aftertaste hangs around for hours. Food prices are a bit high but beer prices are reasonable, plus they have a good happy hour. The lanai looks out over the marina and is quite pleasant. When they have live music I find that it is really loud even far away from the band. The service has always been acceptable. Also, this is not a brew pub so you cannot buy Growlers. Bummer. They do have a small store selling t-shirts, glassware, etc. This was the perfect place to drink fresh beer in Hawai'i. It's right on the water of the Koko Head Marina, which even though is a little inland, is still blue, just like the ocean. There's plenty of wildlife to gawk at, including tons of birds and ducks. The birds were fearless, taking morsels of bread right out of our hands! I hit it right at happy hour, so they had 50% off certain pupus and beers. I had thier coconut porter and thier organic belgian pale. The beer prices during happy hour were $3, but the Belgian and the Barleywine were $6, I guess because they were special brews. All in all a cool little place to go. I only wish I had one here in Charleston.